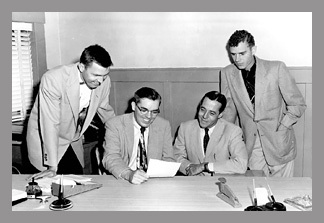 William Walter Rouse (pictured right), a former president and owner of the First State Bank of Norton, was a forward thinking man. 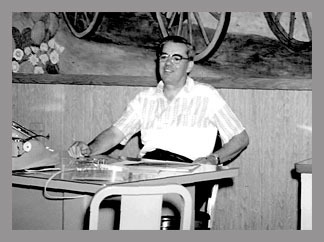 He saw the need to promote tourism in the early sixties for the town in which he made his home. While Norton has had and still has its share of famous sons and daughters, it needed something of historical significance to put it on the map. Mr. Rouse was a lover of history, and he and some fellow community leaders came up with a plan to re-create Stage Coach Station 15 that was used in the year 1859 on the Leavenworth and Pikes Peak Express Route. The committee built a fine replica in Norton and even named a street after the infamous Horace Greeley, New York Tribune Owner and Publisher, who stayed the night on May 24th 1859. The Station 15 Replica is located at the Water Tower Park on Hwy. 36 for travelers and tourists to stop at their leisure to visit. Mr. Rouse had many other talents. He created a mural depicting Horace Greeley approaching the station in 1859, and the community was able to admire and enjoy the mural at 120 S. State in the lobby of the bank. Mr. Rouse received a book as a gift entitled “They Also Ran” by Irving Stone. It is the story of nineteen men who enjoyed, or suffered, an identical fate: they were all defeated for the presidency of the United States. Their stories were grouped according to those analogies which gives history a fascinating plot structure. Mr. Rouse enjoyed it so much, especially since it paid special attention to Greeley who was defeated in 1872, that he immediately started collecting black and white copies of portraits and photographs from the Library of Congress. The bank had moved to a building at 105 W. Main in 1965 and the new location had a spacious mezzanine in which to house Rouse’s special collection. Rouse added a flourished detail to each honoree with a short biography, sometimes accompanied by a special nickname of the candidate and always with by whom they were defeated and what year. With all credit going to Rouse for his unusual shrine to the “almosts” of our political past, since his passing in 1981, there have been other individuals who have been willing to share its uniqueness with visitors from around the country and world. 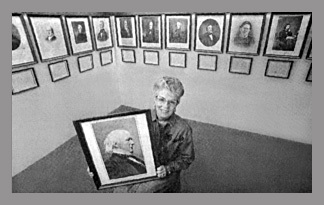 Rouse’s daughter, Ann Hazlett, had taken over as curator when her father passed and fondly recounts that she was raising her family when her dad came up with the idea. 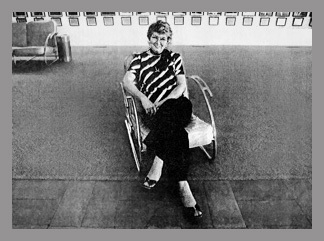 Since Ann’s retirement, Patsy Barnard, a former head teller at First State Bank, had the honor of explaining the details of Rouse’s creation to many visitors. After Pat’s retirement, Diana McGee took charge of securing Kerry’s photo after being defeated in 2004. Lee Ann Shearer has the reins currently and has been instrumental in its promotion in tourist guides and in inaugural festivities. The walls of the gallery display many distinguished gentlemen. Some minor party candidates are present while others are missing. You will also see winners among the losers. For instance: Grover Cleveland is portrayed while he won an election, lost, and then was re-elected as President again. John C. Fremont is a favorite in Norton along with Horace Greeley. Fremont was the first European descendant to be recorded to step foot in what is now Norton, back in May of 1843. He named our river the “Prairie Dog,” on one of his famous expeditions with companion Kit Carson. In 1856, he was the first person to run on the GOP ticket, even before Lincoln was elected as the first Republican president. The “They Also Ran Gallery” has graced many publications, including American Profile, Readers’ Digest “Off the Beaten Path”, Kansas Magazine, Harris Farmers’ Almanac, National Enquirer, and many newspapers across the country. Nebraska Television from Kearney, NE, has even covered the collection on a segment entitled “The Road Less Traveled” in November of 2007. That same television station was present when the gallery had their first ever inaugural open house on January, 20th 2009. Thanks to Rouse, hundreds of visitors stop to visit the gallery yearly. His one idea has been a treasure for us in Norton and we are proud to boast the gallery whenever possible. 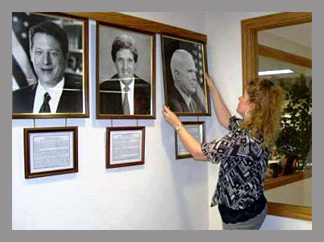 Lee Ann Shearer hangs the recent "Also Ran", John McCain. Photo courtesy Amber Johnson.